In 2011 Sandy Marsh of All Saints Quilters, Axminster suggested that we make a quilt for the Olympics. A Gift of Quilts is the project formed with the intention of giving a patchwork quilt to each country taking part in the 2012 Games and Paralympics as a unique gift of friendship from the people of the United Kingdom. We all rallied round and made a magnificent quilt between us guided by Sandy. Seven of All Saints Patchwork and Quilters set off from Axminster on a very foggy March morning to pick up the 7.30am coach to London at Ilminster. We had a very uneventful and comfortable journey to London, arriving safely at Olympia at 11.45am in brilliant sunshine. 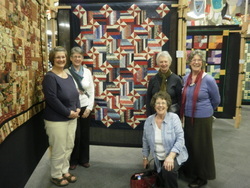 We were all very eager to view the quilts that had been donated by over 400 quilting groups and individuals. All the quilts were magnificent and it took us quite a few hours to view and take them all in. All Saints Patchwork and Quilting quilt was donated to Portugal. There were also some very nice material stalls with some beautiful materials that one just could not resist buying. “Do I need more material?” Will find something to make with it. We all had to buy the book ‘A Gift of Quilts’ compiled by Jenny Rundle and Sharon Garrick, with all the quilts and the countries they have been donated to in it. It is a super book and will be treasured by all. After a very happy but tiring day, and loaded with goodies that we had purchased, we made our way back to Hammersmith to pick up the 6.15pm coach back to Ilminster and home. I am pleased to report that a lovely day was had by all the members that went and a day that we will never forget. co-ordinator for All Saints Quilters.